FREELAND with support from Point Defiance Zoo & Aquarium, the Clouded Leopard Project and several other donors, including US Fish and Wildlife Service, has conducted a considerable amount of carnivore- based awareness work around the Dong Phayayen-Khao Yai World Heritage Site in 2010-11. The activities have occurred in local communities bordering the parks, especially those known to be ‘poacher origin hotspots.’ These are identified and defined when poachers are arrested and their addresses documented. Some communities have extremely high prevalence of poachers residing in them, who have been introduced to poaching by their family members. Awareness activities focus on all levels of the community including students, adult residents, government officials and park staff. Each time FREELAND conducts any training activity, carnivore conservation is highlighted. Specifically, they mention tigers, clouded leopards and smaller felids and their importance as bio-indicators of ecosystem health. 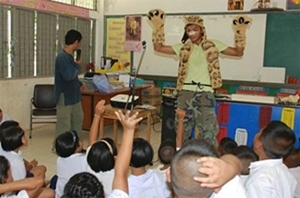 The dual Thai and English language Clouded Leopard conservation awareness book, The Clouded Leopard’s Secret, has been a useful addition to the array of approaches used to keep interventions interesting and fun. During the school visits presenters discuss the different wild cat species found in Thailand, the threats they face and their conservation. FREELAND’s mobile outreach team conducted 28 awareness activities in 2010 to youth camps, school visits and villages. The activities reached nearly 3,000 people, of which 2,350 were in schools and communities adjacent to Thap Lan and in the corridor area where the park joins neighboring Khao Yai National Park. The format of each of these activities is slightly different. School visits are straightforward school based activities, where the team conducts multi-media presentations and lectures, sometimes for a single grade, but often for a combination of grades. Primary school visits focus on simple game- based interactions, plays, and music to excite an interest in wildlife and nature. 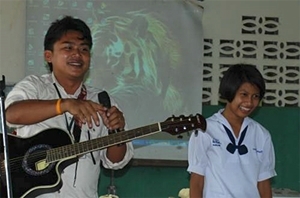 For secondary school students, a more complicated introduction to ecology is delivered, with drama-type activities organized to give students an independent creative role in communication of key conservation themes, such as the impacts of poaching. Clouded leopard books were distributed to all schools after the activities and presenters utilized clouded leopard and tiger teaching resources such as costumes and skull replicas provided by Point Defiance Zoo & Aquarium to engage and teach the students. Evaluation of the educational effectiveness of the programs demonstrated an improvement in the students’ awareness and understanding of the conservation messages presented. In the last year most awareness activities have been focused on Thap Lan National Park, which is in the center of the Dong Phayayen - Khao Yai Forest Complex. The five parks which comprise the complex were designated a UNESCO World Heritage Site in 2005 and encompass 6,150 square kilometers of diverse habitats. Thap Lan National Park was declared Thailand’s 40th National Park in December 1981 and covers 2,235 square kilometers of wilderness with five management zones. Habitats in this vast park include unique fan palm forest (Corypha lecomtei), bamboo, moist evergreen and dry dipterocarp forest. There are areas of grasslands, some of which provide grazing for many large carnivore prey species, such as sambar, gaur and reportedly banteng. The park is also home to a significant population of tigers, clouded leopards, two species of bear and numerous small carnivores. Despite the park only being 2 to 3 hours’ drive from metropolitan Bangkok its biodiversity remains under-studied. Little is known of the landscape-scale abundance, distribution, and ecology of tigers or prey in the park. The absence of such fundamental information hampers effective management and protection of the area’s important wildlife populations. Historically, Thap Lan has been a safe haven from development due to its remote location – situated between forest reserves, national parks and wildlife sanctuaries – isolating it from towns and villages and the threats that often come with populated areas. During the 1960s and ‘70s it was home to a significant force of armed Communist Party of Thailand insurgents. Despite the threat from the communists being solved in mid-1970’s the notoriety of the park means it has been a place to avoid. Today, descendents of former rebels are laying claim to large tracts of land adjacent to Thap Lan, claiming it was promised to them during surrender negotiations. This land-grabbing is reducing the forest reserve buffer that protects the park and the wildlife that lives there. Geographically, Thap Lan’s topography makes it fairly difficult terrain to negotiate; it is a rugged mountainous area ranging between 100 m and 992m in altitude. There are limited access points and a public road inside Thap Lan that winds through the middle of the park has been closed to the public for more than 15 years. Gate figures confirm the park is not popular with tourists, with the park catering for just over 125,000 visitors in 2010, compared with almost 1 million who visited neighboring Khao Yai National Park and its surrounding tourist sites, such as waterfalls. The reduced tourism helps protect Thap Lan and the impact, or lack of it, can be noticed at remote sites which remain pristine. The park has the feeling of an off-limits wildlife sanctuary, rather than a national park and this is another reason why wildlife exists and breeds peacefully. However, sites deep in the complex are now seeing an increase in poaching, possibly related to poachers going further into wilderness areas as wildlife has already been poached from more assessable areas. Unemployment has been rising, leading people to turn to poaching as a means of generating income. The value of some products has also led some Thai middlemen to bring in migrant labor, such as Cambodians, to collect aloewood and poach.